Explanation: It's stars versus gas mountains in NGC 2174 and the stars are winning. More precisely, the energetic light and winds from massive newly formed stars are evaporating and dispersing the dark stellar nurseries in which they formed. 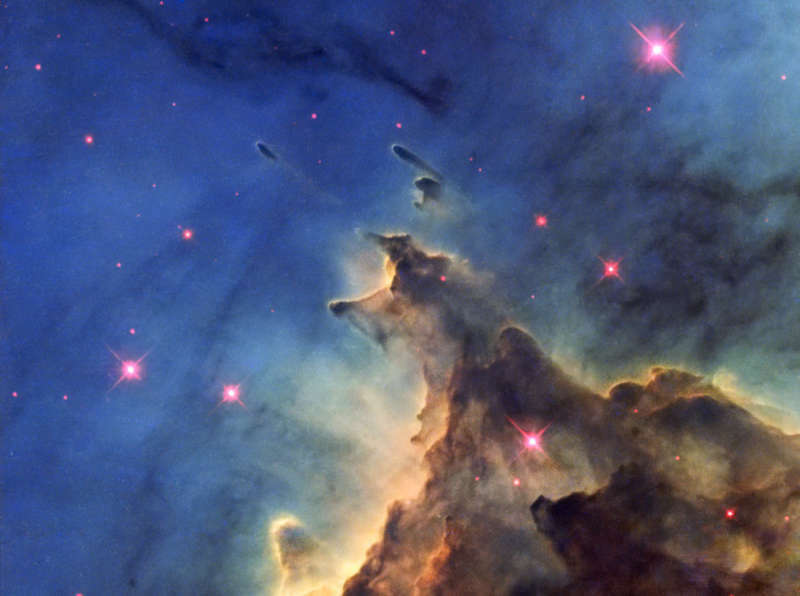 The structures of NGC 2174 are actually much thinner than air and only appear as mountains due to relatively small amounts of opaque interstellar dust. A lesser known sight in the nebula-rich constellation Orion, NGC 2174 can be found with binoculars near the head of the celestial hunter. About 6,400 light-years distant, the entire glowing cosmic cloud covers an area larger than the full Moon and surrounds loose open clusters of young stars. The above image from the Hubble Space Telescope shows a dense interior region which spans only about three light years while adopting a color map that portrays otherwise red hydrogen emission in green hues and emphasizes sulfur emission in red and oxygen in blue. Within a few million years, the stars will likely win out completely and the entire dust mountain will be dispersed.